Sunshine, Moonlight, Good Times, Boogie – the Pirates of the Caribbean party was rocking to The Jacksons’ dance track as Saga Sapphire sailed out of St Lucia. If ever there was an anthem for our cruise, this was it. With the rum punch flowing, passengers spilled from the deck to the balconies, synchronising dance moves, singing to the music and shimmying under the stars. Decorative palms caught the breeze on the ‘desert island’ deck where striped shirts, over-sized earrings and eye-patches were the must-have look. So much effort had been put into this night that the brightly lit Verandah dazzled like a Hollywood film set. And that’s not the rum talking. We had started the day by gliding through the rainforest canopy on an aerial tram and, as temperatures reached 28C, we cooled off with a swim in Marigot Bay, a picture-postcard cove where filming of the Dr Doolittle movie took place. A steel band welcomed passengers back on board and those seductive calypso rhythms captured the soul of this Spice Islands cruise – to embrace the winter sun. 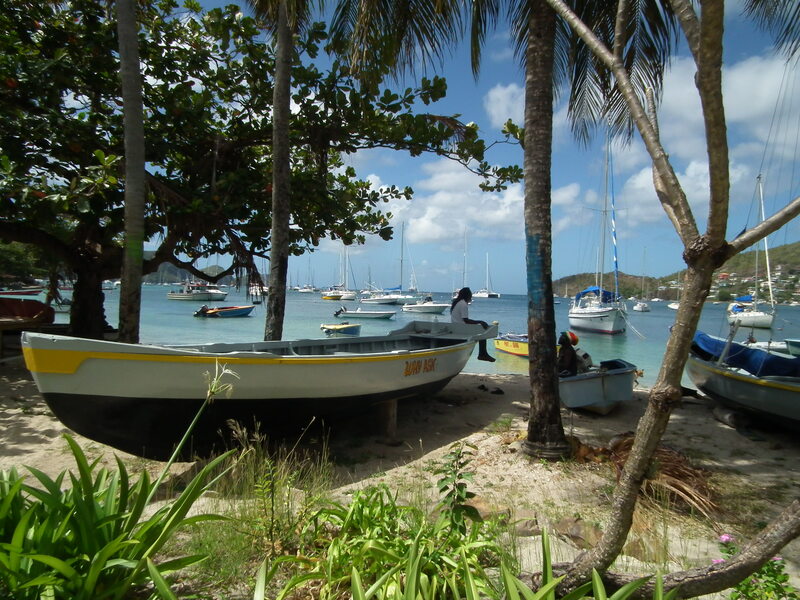 Still buzzing from the party, we docked in St Vincent and arranged a trip to the tiny island of Bequia (above). A glistening guard of flying fish raced our speedboat across the 6,000ft-deep rolling sea, only dropping back when we entered Admiralty Bay. Reggae music wafted from yachts bobbing in the clear water set against the prettiest backdrop of pastel-painted villas dotted in the hillside. On the waterfront we chose Mac’s cafe for lobster pizza and the pre-requisite rum punch al fresco while midnight-blue hummingbirds hovered within arm’s reach. After a siesta on the quiet palm-fringed Princess Margaret Beach, a ribbon of soft, white sand, we languished in the turquoise sea. No wonder her Royal Highness would take a yacht from nearby Mustique to this heavenly hideaway. Our One Day in Paradise was over too soon. We had joined the jet-set for a day by sharing the cost of a speedboat between a group of eight. Another indulgence was to take a 45-minute helicopter ride from Antigua to Montserrat, the Emerald Isle of the Caribbean before a volcano erupted in 1997. The capital, Plymouth, is no longer a playground for the rich and famous but a haunting modern-day Pompeii. From the air you can see houses, schools and trucks still buried in the ash. Montserrat was evacuated but the 19 people who opted to stay were killed by the lava flow. Next stop was nearby St Kitts. 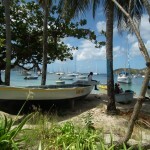 After a gentle overnight sailing, we grabbed a cab to tour the island. Other passengers opted for the scenic railway, once the sugar train that transported cane to the mills. The sugar trade came to an end in 2005 when the EU halted preferential pricing arrangements between Britain and St Kitts. We stopped off­ at Ottley’s Plantation Inn, a 15-minute drive from the port. This 35-acre estate was another haunt of Princess Margaret, and no wonder – with the poolside dining area offering panoramic views over the sea to Nevis. We, too, were treated like royalty at this friendly and surprisingly laid-back retreat. We took a stroll round the estate to walk off lunch to admire the beautiful gardens. 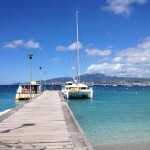 And so on to Martinique (above), with its very French feel. Snorkelling was the order of the day. Prospect, our guide, showed us the way and we jumped into the clear, clear water like a bunch of excited schoolchildren. With beginners’ luck, a turtle swam alongside and everyone on the ship heard about it for days. Saga Sapphire then sailed on to Trinidad, where we found Port of Spain empty on ‘the morning after the night before’ Fantastic Friday carnival celebrations. We drove past Queen’s Park Oval and talked about the days when the West Indies cricket team were at their peak – and how Brian Lara once scored 375 and 400 against England. Ouch. We stopped off to support the Junior Parade at Queen’s Park Savannah, where thousands of children in the craziest costumes were dancing to Soca rhythms. The judges, many looking the worse for wear, were clearly struggling to choose a winner. It was fortunate that half of Sapphire’s 600-plus passengers were there to cheer on the youngsters and wake up the jury. A dancing cricket team, in an all-red kit, sported glitter-sprayed bats, helmets and pads. If those boys can play cricket as well as they can dance and somersault, there’s another formidable West Indies team in the making! This sea of colour was trumped by a visit to the Caroni bird reserve in the still of late afternoon when hundreds of scarlet ibis returned to roost near the swamp. Swooping down in their hundreds, the handsome national bird left peregrine falcons and ospreys in the shade as the sun went down. 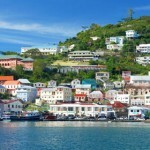 Next stop, Grenada (below), so pretty and relaxed after show-time in Trinidad. At Mollinere Beach, we snorkelled over James de Caries’ underwater sculptures. The 14ft-deep artwork was thought-provoking and all the better for the vast numbers of tropical fish which proved a delightful distraction. We even managed to fit in a quick tour of St George’s old town, with its mini San Francisco hills and tuna-fishing port. It also pleased passengers that the fresh fish was on the menu for dinner. How couldn’t we be pleased? We had woken up to a different view every day, eaten breakfast in the sunshine, explored island after island and spent the evenings getting a taste for fine dining and, of course, dancing the night away. Sunshine, Moonlight, Good Times, Boogie – and a cruise to remember forever. Factfile: A similar cruise, Treasures of the Caribbean, departs on January 13, 2015, from Southampton. The 35-night all-inclusive cruise starts from £5,999 per person calling in at Funchal, Madeira; Porto Grande (Sao Vincente, Cape Verde); Scarborough, Tobago; Hillsborough, Carriacou Island; St George’s, Grenada; Kingstown, St Vincent; Bridgetown, Barbados; Roseau, Dominica; Little Bay, Montserrat; Blowing Pint Anguillla; St John’s Antigua; Ponte del Garda, Sao Miguel; Lisbon, Portugal; Southampton.